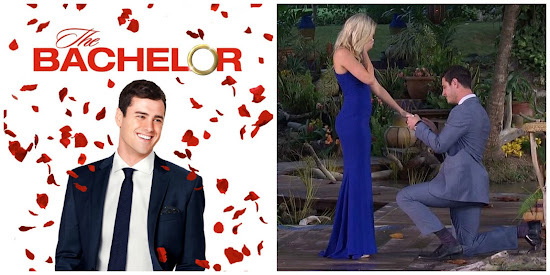 It's no secret that we're fans of The Bachelor franchise. We tune into the dramatic show and love watching how everything unfolds even if it is predictable. It seems that people are split on the show - either love it or love to hate it. I think it's a great show to promote dialogue about relationships and what's working on the screen and what's not. Patrick and I are under no delusion that it's not reality television and there's very much a template for the show throughout the season but that doesn't mean it's not enjoyable. We're able to watch it and reminisce about some of our first dates and be so thankful that we found each other and we're done with dating! The Bachelor really doesn't deserve the bad media it gets but to each their own. With all that being said some seasons are more exciting than others and the drama is built up a lot more! Every now and then with these extra exciting season premieres or finales I'll plan something a little special. For the premiere of Juan Pablo, a Venezuelan native, we made a traditional dessert from the area - dulce de leche and served it with apple crisps. And then for Bachelor Chris's finale we made Fantasy Sweet cocktails. Well Bachelor Ben did not disappoint all season long! We were particularly excited about his season finale and to see who he would choose. For the first time ever the lead had told the final two women that he loved them both which has never been done before!!! The finale aired in Jamaica so we celebrated the episode with Jamaican night - a deliciously marinated Runaway Bay Jamaican chicken, coconut rice with mango and pineapple, a side salad, and rum ice cream. It was the perfect meal to accompany Ben's proposal to Lauren B! At first Patrick was skeptical of Jamaican night but enjoyed our meal. The marinated chicken and rice side would be perfect for a summer grill out. I wouldn't be surprised if this makes an appearance at our outdoor table this summer. Check out the recipes below. Preheat an outdoor grill for medium heat and lightly oil grate. We used our stove top grill pan. Rinse and drain rice in cold water. Place in a saucepan with water, coconut milk, and salt. Place the pot over high heat and bring the liquid to a boil. Stir and reduce the heat to the lowest possible setting and cover the pot tightly with the lid. Continue cooking for 15 minutes. Remove the pot from the heat and let stand 10 minutes, covered. Fluff with fork, add mango and pineapple, and serve. Place eggs in a large mixing bowl. Using a whisk, whip eggs until frothy. Add 1/4 cup of the brown sugar and 1/8 teaspoon of the salt and whisk until well blended. Set to the side. Place milk, cream, 1/2 cup of the brown sugar, 3/4 teaspoon salt, nutmeg and cinnamon in a heavy saucepan. Cook over medium heat until hot, but do not boil. Remove from heat. Combine the cream into the egg mixture in a slow, steady stream, whisking constantly. Pour the mixture back into the saucepan and return to the heat. Stir with a wooden spoon until the mixture reaches 175F on an instant read candy thermometer. Again – DO NOT BOIL. Immediately remove from heat and strain the mixture through a fine sieve or cheesecloth into a metal bowl. Add the rum and stir until blended. Cover and chill in the refrigerator for 6 to 20 hours, but do not hold the mixture more than 24 hours before making the ice cream. Transfer the mixture to the container for the ice cream machine and freeze according the manufacturer’s instructions. Ice cream may be stored in an air-tight container in the freezer for about 7 days.